Today, we are going to visit two energy efficient homes designed by architects DESIGN STUDIO ARCHIPELAGO. There is a saying: Less is more – today we will find out just how true that it is! These two homes are super simple but super sleek. What's more is that they prove just how gorgeous green architecture truly is. Living an eco-friendly home can be as stylish as it is responsible. Katrina II G1 ENERGO PLUS – dom, który będzie dla Ciebie oszczędzał! 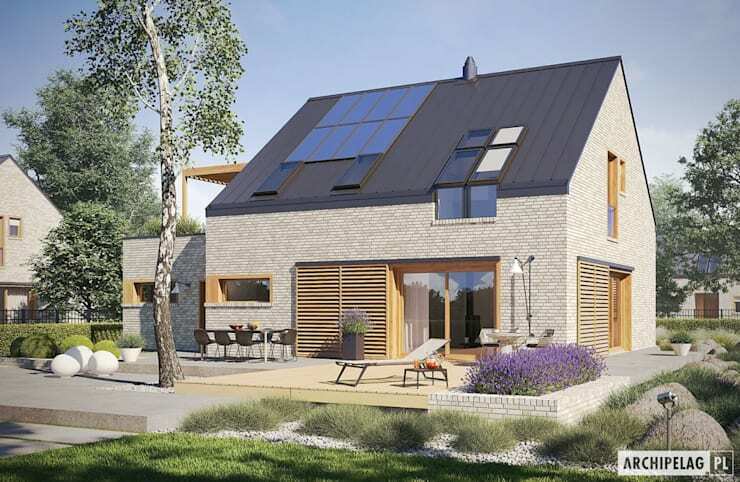 This modern home is equipped with a heat pump, solar system and mechanical ventilation. 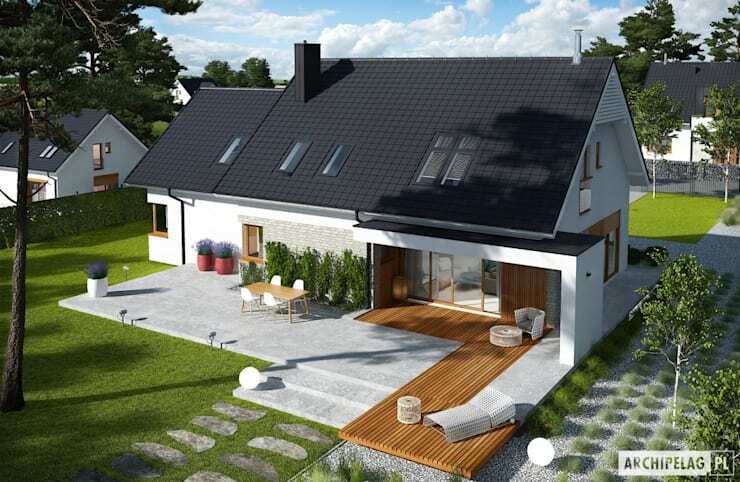 Yet it looks simply beautiful and classic with its gable roof and pale, textured facade. 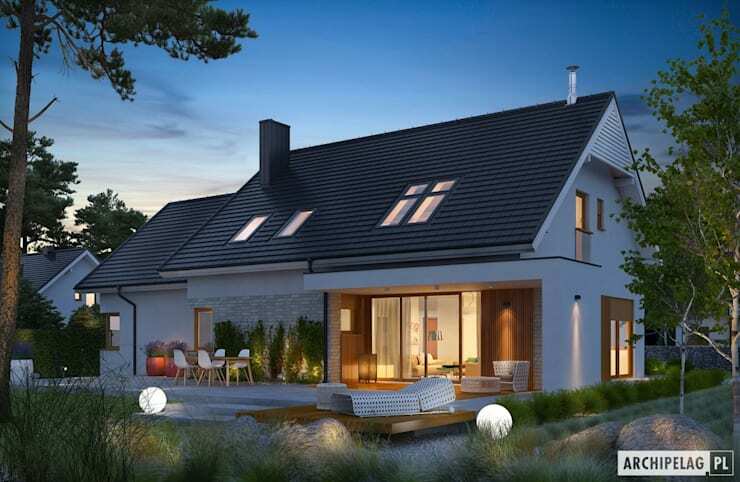 Here we can see how the small home spills out onto a functional little terrace, where family and friends can relax in the sunshine and fresh air. This connects the interior spaces with the exterior spaces, making for a wonderful flow. It also makes the home seem bigger! From this angle, we can see how the upper level of the home, which features the bedroom, opens up onto a cute little balcony area that is covered. This extends the private areas to the outdoors, allowing for views of the beautiful surrounds. 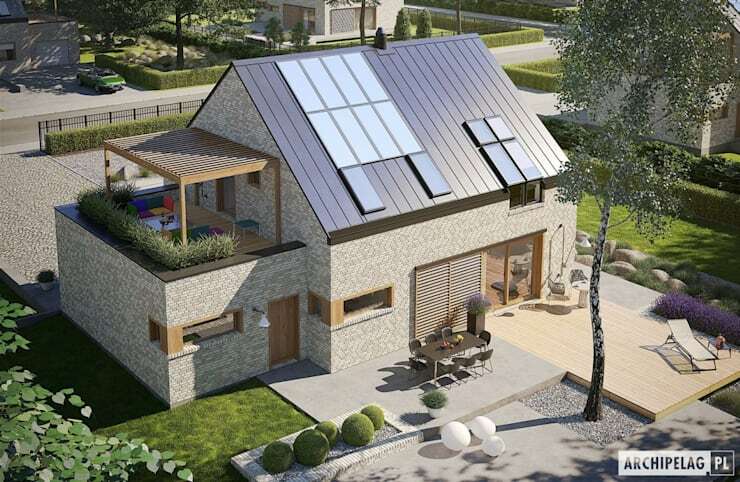 We can also see the solar panels on the roof, allowing the home to be powered by the sunshine. Trendy and eco-friendly! The front of the home is slightly more private than the back of the house, yet it is just as welcoming and warm. Tip: Add a pot plant to your entrance for a natural touch of decor. 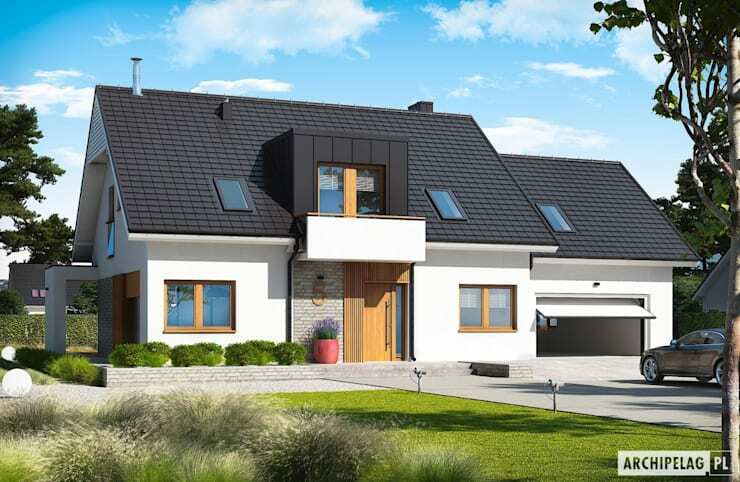 This home is designed for a family who enjoy a modern and spacious design. The architects have tried to keep the design simple and original, while paying attention to even the smallest of details. The result is a warm and earthy facade that combines elegant white plastered walls with light wooden cladding. The home is also equipped with extensive glazing, ensuring that natural light flows into the interior space. This keeps it warm and bright. The focal point of this design is the large living area, with its dining room and living room that spills out onto the spacious terrace. There are also three cozy bedroom, two bathrooms, a dressing room and extensive views of the surrounding countryside. 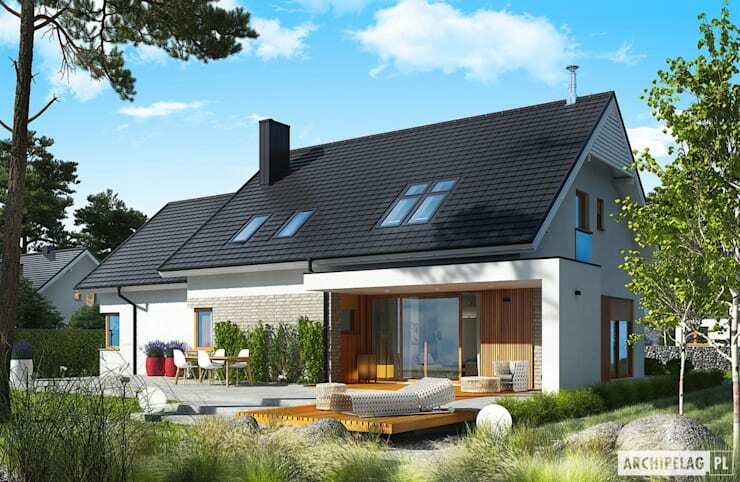 This project is a wonderful combination of economic precision and modern comfort. The front of the home is very modern and savvy, with different materials used throughout the facade to create a very on-trend design. Once again we can see how valuable a pot plant or a small front garden is to a home design. Here we can see how modern the terrace is with its mix of wooden floors and grey tiles. It connects harmoniously with the surrounding garden. Couldn't you imagine relaxing outdoors in the fresh air and sunshine? In this image, we can see how modern lighting enhances every detail and design of the home. Use garden lighting to add romance and mystery to the look and feel of the exterior space! 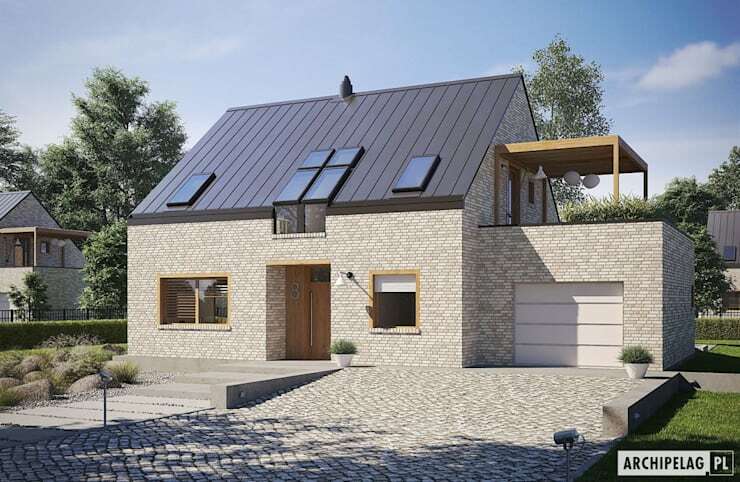 Would you opt for an eco-friendly home?